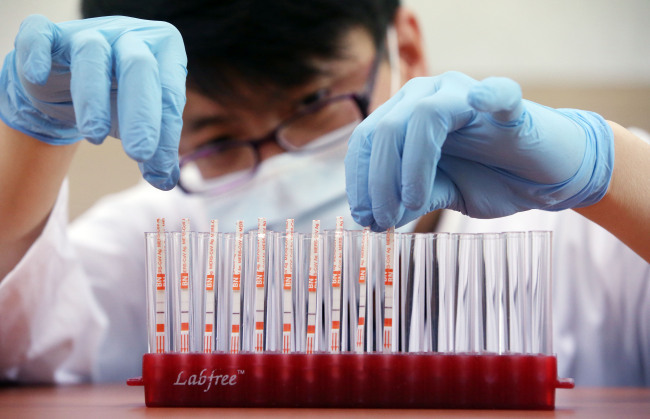 South Korea reported one more confirmed case of the Middle East Respiratory Syndrome on Saturday, raising the total number of people infected with the disease to 13. The latest infected person is the husband of the 12th confirmed patient, according to the Health Ministry. He was in the same hospital where the country's first MERS case was reported to take care of his ill wife. The ministry explained that the new patient does not seem to have contracted the disease from his wife but from Patient No. 1 since she was not showing suspected symptoms at the time. He was later admitted to the same hospital after coming down with a high fever and other symptoms. He has been placed in isolation after testing positive for the virus, the ministry said. Of the total 13 patients, 10 were reported in the hospital where the country's first MERS case was confirmed on May 20. It has temporarily closed its doors as many medical staff members have been placed in quarantine and are being closely monitored as they came in contact with infected patients. MERS is a viral respiratory illness that is fairly new to humans, with only 1,154 reported cases in 24 countries since the first case was confirmed in Saudi Arabia in 2012. There is no vaccine or treatment for the disease, which has a very high fatality rate of about 40 percent. Anxiety is mounting here as the number of MERS patients seems to be increasing fast in recent days. On Friday, five people were diagnosed with MERS, including a South Korean traveler in China. Rumors and fearful comments about MERS and how it is transmitted are circulating through social network services, apparently reflecting growing worries about the virus. The ministry said it will take "stern" action, including launching police investigations, against those who intentionally spread groundless rumors about the disease.